15 - 15 parallel dots (Neer Pulli) Kolam - Start with 15 dots - 15 lines. Start from the center dot (leaving 7 dots both sides) and finish the kolam. Erase the remaining dots. Super Collection of kolams kamala..
intha markazhi kku unga blog a thaan parthu poda porean.. Thank you for visiting Kolam page and posting your comments. It really encourages me to post more kolams. If you put the dots properly, then it is very easy to connect the dots and complete the kolam. Yes. We have lots of rangolis without dot. But it requires drawing skill. I have also published some ragolis without dots under "Neli Kolam" category. Please check the same. very nice to get this kolam. 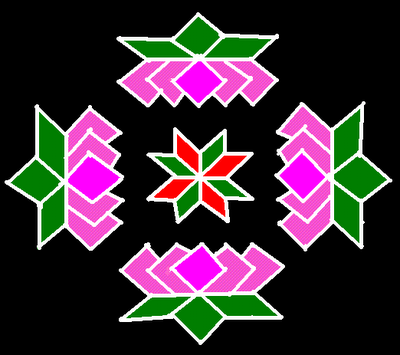 i sechered for pongal kolam for last two day but finaly i got it from ur site tats realy nice. Welcome to my blog. Hope you like the kolams. Thank you for visiting my blog and your kind comments. I do not right now have videographing facility. Once I get it, I will demonstrate the drawing in paint. Meantime, can you please give me your facebook link so that I can view your rangoli. Regularly i checked your blogs and updated your collections. you are done a great job. Your collections are very wonderful things. Simply i like to say that i love your collection. Superb kolams... Now life style has been changed. Apartment will not be having much space to put larger klams and al.. my kind request is Put some kolams with less number of dots(Upto 10,12). Thank you Bharathi for visiting my blog. As you rightly said, we do not have much space in the City to draw big kolams. I have already posted sall kolams too. Please check the same. U have a wonderful collections of Kolams. Iam a beginner and ur blog was a good guide to me. Thanks! !